I've never been much of a fan of fast food. Sometimes it tasted good, but usually I just ended up feeling weighed down. Literally and figuratively. Now that I need to be gluten-free, almost all fast food is taboo. Cross-contamination is extremely likely in most fast food restaurants, even if I could order something without gluten ingredients. I know how sensitive I am to cross-contamination. During our recent travels, we stayed at a chain hotel that offers a hot breakfast every morning. On one of these mornings, I watched as my omelette was made in the same spot of the griddle that had just had pancakes cooked on it. Yep, I got sick. That's how sensitive I am. My omelette didn't have any gluten ingredients, but it was made on the same surface as gluten pancakes. That's cross-contamination for you. And it got me. Knowing that I am this sensitive is a pain. Sometimes literally. It really is an inconvenience when traveling and I'm not able to make my own food. If I could just pick the meat patty out of a burger, life would be much simpler. But that's just not possible for me. So, I'm always on the hunt for new, safe options. A safe, fast food joint? Isn't that an oxymoron? Not this time. 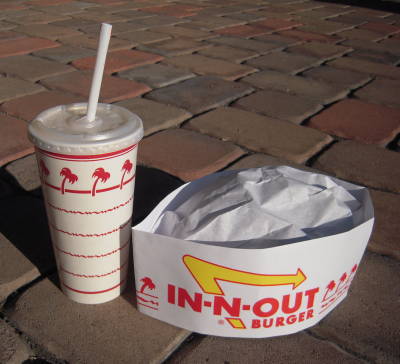 Enter In-N-Out Burger. In-N-Out Burger is a fast food restaurant with an extremely limited menu. Burgers, cheeseburgers, fries, shakes, sodas. That's it. Sound pathetic? Quite the opposite. These are, flat-out, the best fast-food burgers ever! See, In-N-Out is unique. It has no freezers in which to store their meat. Everything is delivered fresh every day. The fries are made with fresh, peeled potatoes that are cut on the premises. In full view. Right before your eyes. And the lettuce, onion and tomato? They are fresh too. Full leaf lettuce. Onions and tomatoes sliced right in the restaurant. Everything is fresh. And wonderful. So, how do I eat gluten-free in a fast food restaurant? 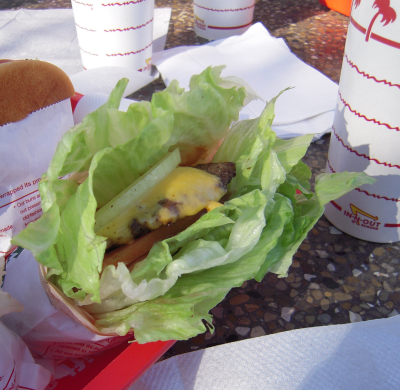 First, choose a quality place like In-N-Out and know how they process (or not) their food. Second, order a cheeseburger "protein style". No bun. Some call it protein style. Some call it animal style. I prefer the former. See that full leaf lettuce? There are several layers holding all of my cheeseburger-goodness together. Third, order the fries, but only from In-N-Out! Ah the fries.... How could I forget to take a picture of those fabulous fries?! Long, skinny, perfectly done fries. These fries are special. They are special because they are safe for gluten-free eaters. Why? Because In-N-Out doesn't put anything in their oil fryers except potatoes. That's it. No batters. No flours. No other anything goes into those fryers. Just fresh cut potatoes and oil. Both of those are gluten-free. That makes these fries just about the only restaurant fries that are gluten-free! And they are fabulous! I have never gotten sick after eating at In-N-Out. Not once. And this place is so good that my entire family was begging to eat here more than once during our travels. See, the only down side is that they have a limited number of locations in only a few states: California, Nevada, Arizona, Utah and Texas. I'd love for them to expand to our area, but certainly not at the expense of the quality. Their food quality is everything. This just means In-N-Out becomes one of our chosen destinations when we travel to these places. Thanks for the safe burger and fries, In-N-Out! Wouldn't mustard make it not gluten free? Also are the onions cooked in butter? Nearly all mustard is made of just a few items, mustard seeds, vinegar, salt, water and some times tumeric. I realize this is an older post, but I came across it googling in n out burger gluten free. You see I'm meeting a friend there for lunch, and I can't eat gluten. As a super gluten sensitive Belgian, visiting with friends in California next month, I can't thank you enough for this post! It'll be the first time in my now 2-years of being GF that I'll be able to eat anything fast food. Think I'll very much resemble a kid opening their Christmas presents when I walk into In-N-Out next month. :-D Thank you sooooo much! I got sick on a protein style and fries there yesterday. Never happened before. But the moral of the story is, if you eat out at all, you're at risk.